When Kenner released their Aliens vs. 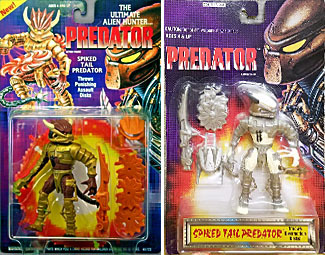 Predator toys in the '90s, they didn't include any bios for the characters - there was barely room on the cluttered cardbacks for basic instructions about the play features, let alone any personal information. That means NECA is free to craft their own unique takes. The leader of the Rogue Space Tribe, Spiked Tail is allied with the Armored Lost and Lasershot Predators. 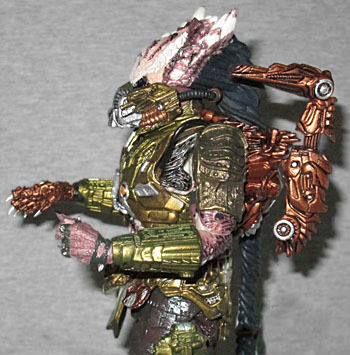 Spiked Tail's unorthodox hunting methods and use of illegal weapons caused the exile of his team from Yautja Prime. Using stolen time/space technology, the Space Tribe can travel much farther in the galaxy than most Yautja. This has allowed them to advance past hunting organic beings: they find non-organic mechanical beings to be more challenging prey and have modified their gear accordingly. 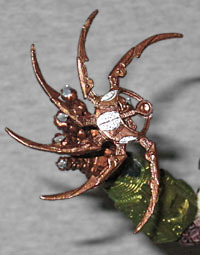 Spiked Tail's age is assumed to be considerable, thus many suspect that the robotic trophies he claims for ornamentation are actually physical enhancements necessary to keep him in capable condition. In addition to hunting robotic life, a mysterious rival Yautja, the pirate called R'Zor, has threatened several Space Tribe missions and thus he has also become a target. See, isn't that fun? It ties this guy in with existing characters, hints at the release of others (Lasershot was another old Kenner toy), and even delves into the unknown history of the line, all while telling a story about how this guy is spending his time(-travelling) hunting either Terminators or Transformers. How badass is that! I didn't have the original Spiked Tail Predator, but research reveals that this one has strong connections. In 1994, the character had brown skin and golden armor, which is a fairly apt description of this one, too. The armor is only the same in the broadest strokes: obviously the edge in detail goes to NECA, because it's been more than 20 years since Kenner's, and this one is twice as tall, but we have things like a small circle on the left side of the chest, items hanging off the right side of the chest, and a pointy metal loincloth. The original toy had full armor down the outside of the arms, while this one just has pauldrons and gauntlets, but he does still have fancy leg armor with big pistons - and the silver stuff on top of his feet looks like Endoskeleton toes! His mask has a single orange eyeslit set in a broad, flat bronze armor, looking like a cross between a robotic crab and a Cylon. In the '90s, that was an actual slit the toy could actually look through, while now it's just a design element. The mask has two "tusks" coming off the cheeks, which used to look like blasters and now simply appear to be sharp metal, while the things that used to just be ridges over the forehead have been reimagined as short silver blades. It's a great design, and that's just the outside - the inside is technological, too! Yes, if there's an inside, that means the mask is removable. Kenner's Spiked Tail had a very weird head, with lateral ridges on the forehead and a big pair of horns - neither of which is a very "Predator" feature. 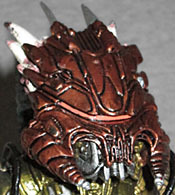 NECA's made him look more like his cousins, with a rounded spiny pad on his forehead, and overiszed cranial spikes that just happen to look like horns. Much better! Everything below his eyes is covered in a breathing mask/facial prosthesis, like a larger, more ornate version of the Battle-Damaged City Hunter. Despite his name, Spiked Tail does not actually have a tail - what he has is all his dreads pulled back into a super-thick braided ponytail, which reaches nearly to his knees and has a flat mace bound into the end. It's molded from soft PVC and has a wire running through the center, so you can pose it however you like. The figure has a balljointed neck, swivel/hinge shoulders, double-hinged elbows, swivel forearms, balljointed wrists, a balljointed chest, swivel waist, swivel/hinge hips, swivel thighs, double-hinged knees, and balljointed ankles. Plus the mace on the end of his hair turns. 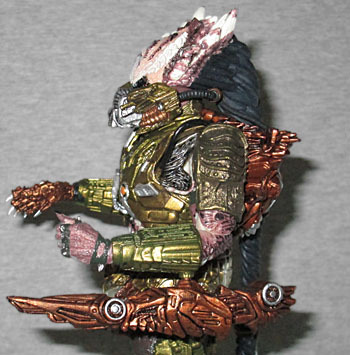 There were actually two Spiked Tail Predators back in the day: the first was brown with golden armor, while the repaint was in more traditional Predator colors - tan skin and silver/gray armor. 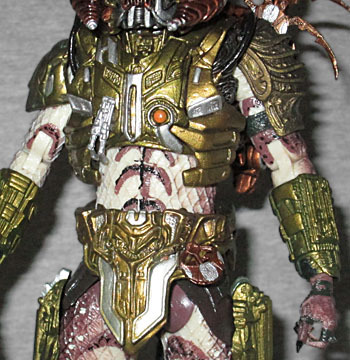 NECA's manages to homage them both, by making his skin both dark and pale brown, with patches and stripes, and by making his armor a mix of silver and gold. The skin looks better this way than being one solid shade - more "natural," if such a thing can be said to apply to a toy-based spinoff of a fictional movie space alien. The original toy had a disc-launching feature where you'd load a throwing star into his robotic arm brace and then use his spring-loaded waist to fling it. NECA has interpreted the arm brace as a fully robotic hand, which is even cooler! Instead of a unique disc, he comes with one of the AvP throwing stars, done in the same colors as his helmet and hand. There's a notch in his backpack where it can store, too. His secondary weapon was a humongous gun that plugged into his left forearm, and this toy has the same thing. The big shapes are all the same, but like the armor, the modern version has tons more detail. It also has a bonus play feature! A segment in the middle of the gun slides back, revealing a post that can swivel. Add to that a hinge near the tip of the gun, and the fact that you can plug the entire thing into his new backpack, and suddenly the rifle transforms from an arm-mounted weapon into one that's more like the traditional shoulder plasma caster! So much fun! 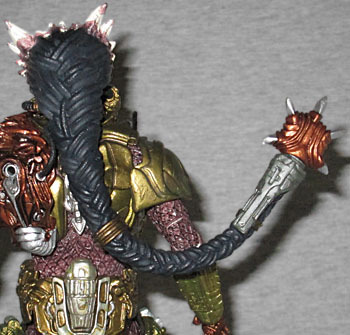 The original Spiked Tail design was kind of stupid, but NECA turned it into something truly amazing. An incredible sculpt, lovely paint, fun accessories, and a backstory that should really get your creative juices flowing? How can you go wrong with that?